The idea for this post was born when I visited the Arts in Hats event, that was happening not too long ago. Belle Roussel, owner and designer of Chop Zuey, made the wonderful “In Memory of a Watermelon Fascinator” for that event and from the moment I saw it, I had the imagination of being in a museum watching art. The wonderful “La Traviata” gown as well is one of the newest creations of Chop Zuey. Belle started to make full gowns with matching jewelry parts not too long ago and opened her new Sky Boutique, where you can find all this amazing creations. The “La Traviata” gown is available in different colors but with my addiction to black clothing, I certainly picked the black version for the post 😉 The wonderful black gown is mesh made and the amazing jewelry parts, like the upper end of the gloves, the beautiful shoulder part, as well the earrings, bracelets and the necklace are part of the gown. Basically Belle made a ready to wear outfit for all lovers of the elegant evening wardrobe ;). 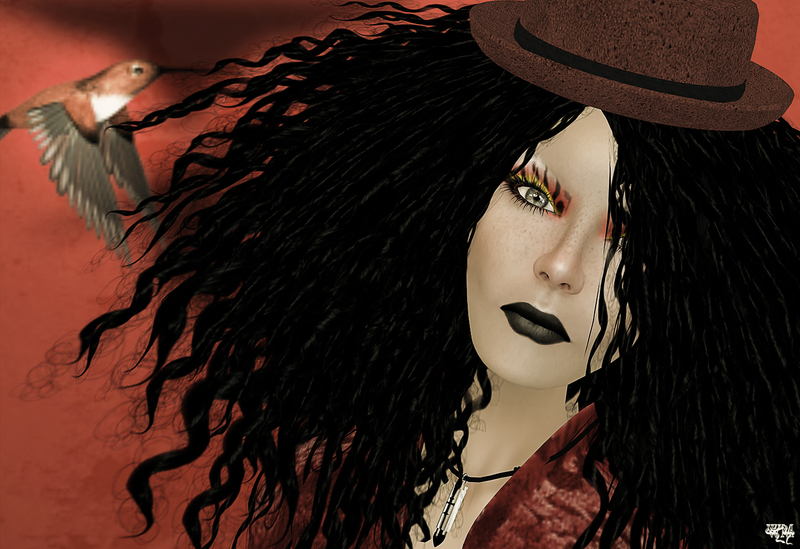 The hat is one of the amazing creations of Xenobia Foxclaw. She made an amazing collection of black and white hats and the “Blackwell No. 6” is just one of them. So you might wanna go over to the Xen’s Hats Mainstore if you wanna see ll of the new releases ;). The Runway Perfect Hunt goes in it’s 4th round :). Morgane Batista again made it, to get amazing designers to participate in one of the most famous hunts on the grid. Even if the title says “The hunt with models in mind” does not mean this hunt is limited to models only. All the amazing and versatile designs are amazing additions to everybody’s wardrobe, even the males will find some amazing hunt prizes in some locations 😉 This year the hunt is not a total freebie hunt, each hunt item costs $5 Linden. With a total of 50 shops you reach a maximum of $250 Linden, what is a great amount for so many amazing quality designs! For today I would like to spotlight the first 4 stores with a mix & match styling. The outfit comes from location #28, Svart. Angexx Quandry created one male and one female outfit. Certainly I used the female one called “Ren”. Shorts and top are mesh made and come in various sizes to make sure that it fits all kind of avatars. The super cool hat comes from Xen’s Hats. A blue Feodora style looking hat with an amazing texture, that really gives the hat a realistic fabric. The amazing lips gloss was provided by [mock]. The “Mariellis Lip Shine” comes in 3 different colors and each has 3 different versions. To complete my styling I added the “Cubism” glasses from epoque because they underlined the retro feeling, that came with the outfit and the hat, in such an amazing way. The jewelry is one of my long times favourites from Mandala called “Sinra”.